The researchers associate pollution with diabetes by referring to previous evidence that suggest PM2.5 particles, when inhaled, reduce the body’s ability to respond to insulin. A recent research paper has quantified a connection between air pollution and diabetes. Published in The Lancet Planetary Health, it estimates that air pollution contributed to 3.2 million new cases of diabetes — 14% of all cases worldwide — in 2016. The researchers associate pollution with diabetes by referring to previous evidence that suggest PM2.5 particles, when inhaled, reduce the body’s ability to respond to insulin. Based on air quality data, the paper found that in India, the attributable burden of disease (ABD) is about 5.9 lakh (see chart) which translates into an age-standardised ABD of 48.7 per lakh population. Worldwide, this is 40.4 per lakh. For arriving at their estimates, researchers tracked 1.7 million US veterans for almost a decade to assess their risk of developing diabetes, and used a mathematical model factoring in global data on diabetes risk, and air quality data from the US Environmental Protection Agency and NASA. On the night of July 27-28, India will witness this century’s longest total lunar eclipse, at 1 hour, 43 minutes. The entire eclipse — partial and total — will last 3 hours, 49 minutes. The previous longest total lunar eclipse of this century lasted 1 hour, 40 minutes on June 15, 2011, the Ministry of Earth Sciences (MoES) said. The Moon will be at the farthest from Earth in its orbit on July 27 and will take a longer time to travel a greater distance of the Earth’s umbral shadow cone. Apart from India, the eclipse will be visible in parts of the Middle East, Central Asia, and eastern Africa, scientists at NASA’s Goddard Space Flight Center said. It is expected to turn the moon appear deep red at its peak point, when Earth’s atmosphere scatters light from the sun onto it. 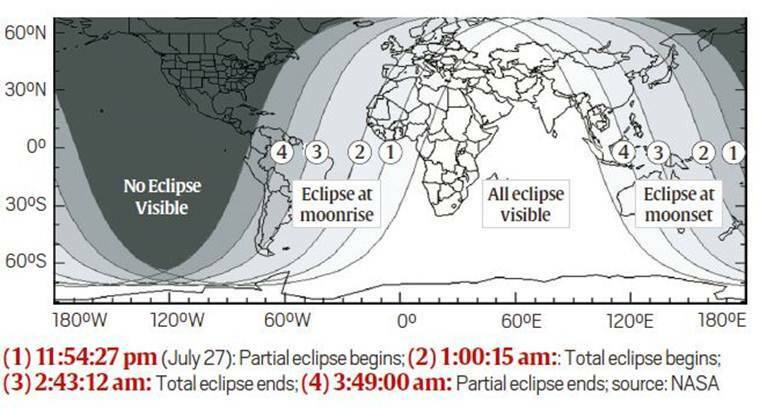 In India, the partial lunar eclipse will begin at 11.54 pm on July 27, and the totality phase will begin at 1 am on July 28 and will last for an hour and 43 minutes, said the MoES. Then the Moon will start to gradually come out of Earth’s shadow and the partial eclipse will end at 3:49 am IST. Over the last 10 days, as Nawaz Sharif has been convicted and now arrested, news reports and commentaries have made repeated references to the Pakistani “deep state”, which the former Prime Minister believes has already rigged the elections scheduled for July 25, probably in favour of Imran Khan’s Pakistan Tehreek-e-Insaf. And in the US, supporters of President Donald Trump have accused the “deep state” of undermining his administration, frequently through politically motivated leaks. The expression “deep state” usually refers to an architecture of unelected government officials, mostly comprising shadowy characters from the intelligence community, which works to undermine elected leaders. It is believed to have originated in Turkey — a translation of derin devlet — which The New York Times defined in a 1997 article on Turkey as “a set of obscure forces that seem to function beyond the reach of the law”. 2 Who posts, transfers Delhi bureaucrats?